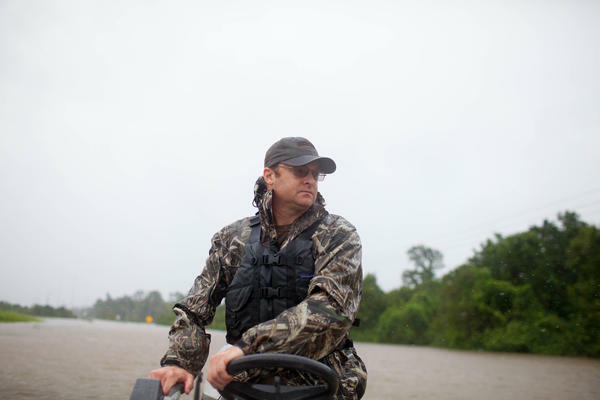 Troy King navigates his boat through a flooded portion of Highway 90 in Houston on his way to rescue the Galvan family. Rene Galvan pulls a boat holding his family members. "We're trying to get my family out. Save 'em," he says. "Help to bring my family back home." 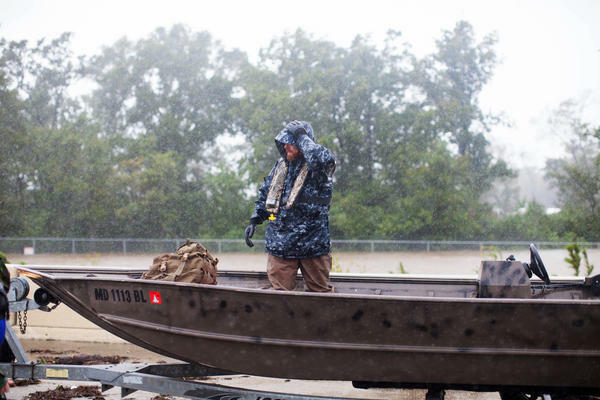 Ted Middleton prepares to launch his boat from Highway 90 in northeast Houston. Spc. 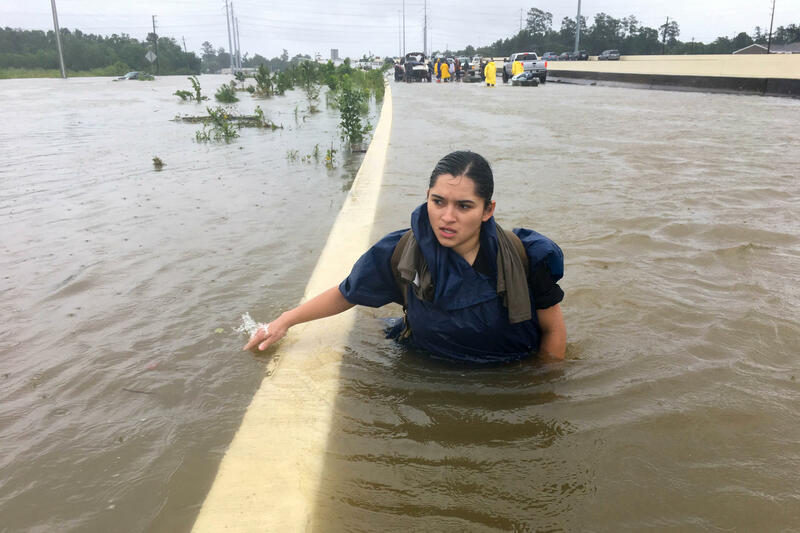 Andrea Villela, from Fort Hood, took emergency leave to try to find her family that is stranded in Houston. At this time, she can not reach her family, so she is doing water rescues until she can meet up with them. 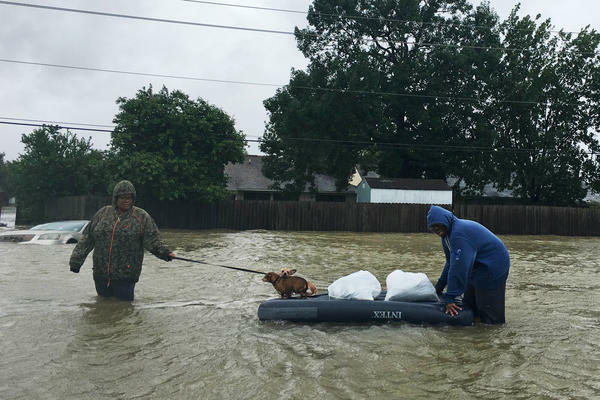 Amber and Curtis Fletcher evacuate their neighborhood with their dogs in northeast Houston, using an inflatable twin mattress they had at their house. 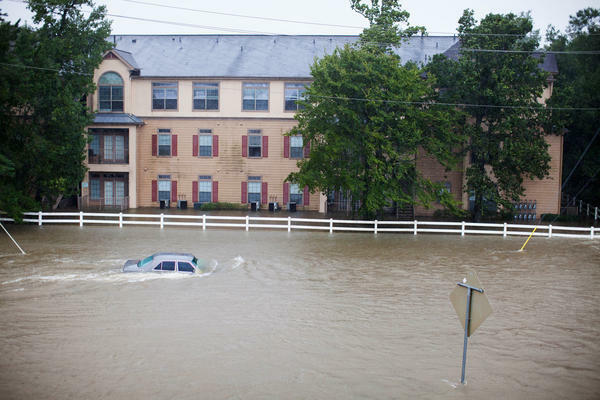 The variable depth of flooding in this northeast neighborhood makes rescue efforts difficult. Shallow water means having to drag boats, but the quick moving currents of deeper waters can make maneuvering boats filled with people dangerous. Six days after Hurricane Harvey first crossed the Texas coast, Houston is still in rescue mode with people stranded in houses and apartments. 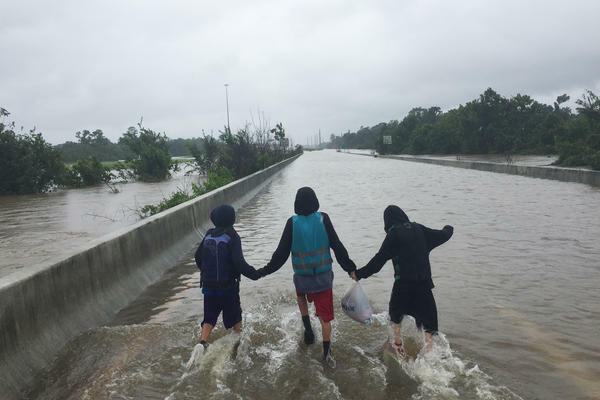 Three Galvan cousins hold hands as they walk on the flooded highway. With the authorities overwhelmed by the scope of the flooding, private citizens have been rushing to Houston and towing their own boats to conduct rescues. Rene Galvan has come to a makeshift boat launch on flooded Highway 90, looking for rescuers. In a soaked, blue hoodie, he sits anxiously in the bow of an aluminum boat, wondering how they're going to get to 14 members of his extended family who have been stranded by rising water. "We're trying to get my family out. Save 'em," he says. "Help to bring my family back home." He says his relatives are waiting for him only five minutes away, but that's by car. It will take considerably longer to reach the Galvan family in this boat, along with another one that's helping. The watercraft have to make their way through an obstacle course of underwater trees and hidden concrete barriers, treacherous currents and submerged tractor-trailers. After 2 to 3 feet of rain fell over five days, Greens Bayou has swollen into a lake that covers a large section of northeast Houston. "I had some free time, had a boat in the garage, so it seemed like a good match. Come out and try to extract some people," says Ted Middleton, who drove over from San Antonio towing his V-hull, 40-horsepower bay boat. "We've just been riding around looking for an extraction. Finally, this one came along," he says. He's joined by two soldiers in soaked uniforms, Spc. Andrea Villela and Spc. Katie Cash, who asked for a leave from their unit at Fort Hood to come down to Houston. "[Villela] has family down here," Cash says. "So we came out initially to try to get them out. Then we met Ted, and we've been trying to save as many people as we can now." The two skiffs motor through a dream sequence of surreal sights in this watery landscape. A black horse wanders along the shoulder of a highway bridge, confused and wet. A fleshy man with a tattooed torso stands impassively in water up to his chest — as though this is all normal — and politely waves off an offer to climb in the boat. A couple hip-deep in water is towing an air mattress carrying two shivering Chihuahuas. Meanwhile, Galvan has reached one of his brothers on his cellphone. "Stay right there," he says urgently. "We're trying to see if we can drive the boat over there." The two boats are cruising alongside a road whose condition lives up to its name — Lake Houston Parkway. But the pavement is getting so close it's possible to see yellow lane markers. "We're running out of water here," Middleton says. Both volunteer rescuers tie off their vessels. Galvan hops out and sloshes toward a dry street intersection a couple of hundred yards away. About 20 minutes later, a white Ford Expedition drives down the center of Lake Houston Parkway toward the boats, creating a wake in 2 feet of water. The Galvan clan is packed inside the vehicle — six adults and eight kids, all grinning ear to ear. "We were at the apartment," says Jaime, Rene Galvan's brother, who is driving. 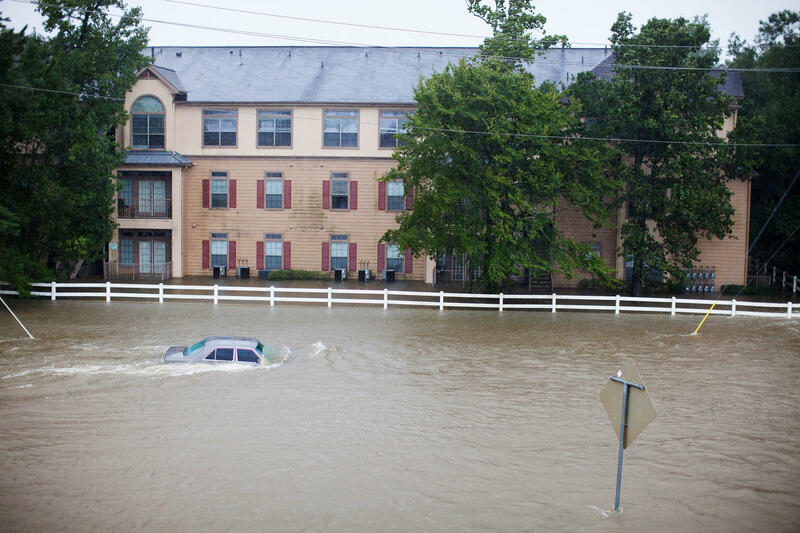 "It wasn't flooded. But the lights went out, so we had to move." The family saw the water was not going down, the power was not coming back on, and they were about to run out of food. So they called Rene and asked him to find a way to pick them up. The boatmen decide they'll have to make two trips for the large family, the other rescuers and two journalists. Only one of the two soldiers will ride in the first boat shuttle; how do Villela and Cash decide who goes and who stays? They play a quick, spirited game of rock, paper, scissors, and Cash wins. The second boat is piloted by Troy King from the East Texas town of Carthage, 200 miles north of Houston. He works at a lumber factory making plywood, and fishes for crappie in his flat-bottom boat. He says he saw the Houston floods on the news and it moved him. "I tell you something I read in the Bible," King says, steering back toward the highway ramp. "There's a passage in 1 John I'm going to paraphrase: If a man has the resources to take care of people and to help people when they're in need and he doesn't do it, then it's wrong. And that's something that's been on my heart. When I read that I knew I had to do it. And I came down here." The danger of this epic flood cannot be overstated. 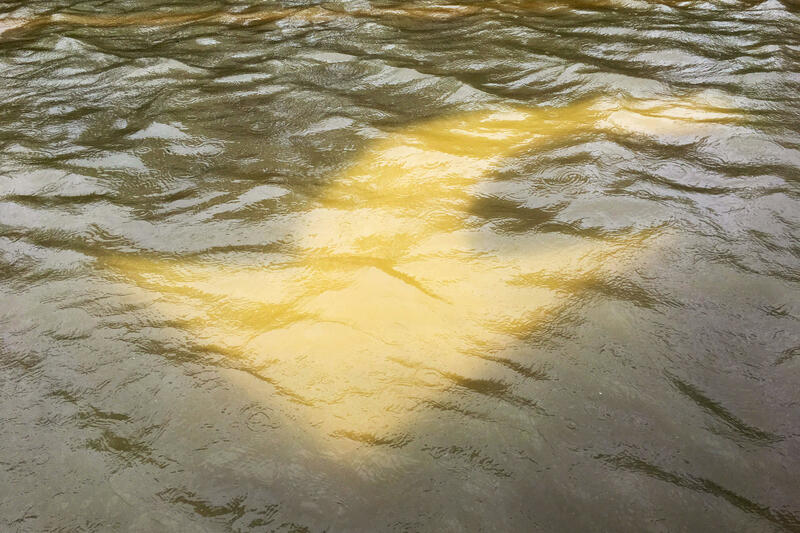 Earlier Wednesday the Harris County Sheriff's Office reported that divers had recovered a family of six, including four children, who drowned in a van that tried to drive through this same body of water, Greens Bayou. King, dressed in camouflage hip waders, squints at a section of churning floodwaters flowing through a tangle of trees off to the left. "You don't realize how close to death you are right there," he says. The Galvan children, one as young as 8, are shivering in their life preservers, but they are clearly having the adventure of their lives. They hold hands and high-step in shallow water on a highway bridge. And then — nearly three hours after the rescue started — it's over. The boats nose up to the concrete ramp. "Thank you," Juana Galvan says. "You're welcome," replies Middleton, helping her out of his boat. In the drizzling rain, the Galvans pile into two waiting pickup trucks, with the kids sitting in back, and drive to their grandmother's house. There, they take hot showers and eat some tomato soup, and all take a nap. 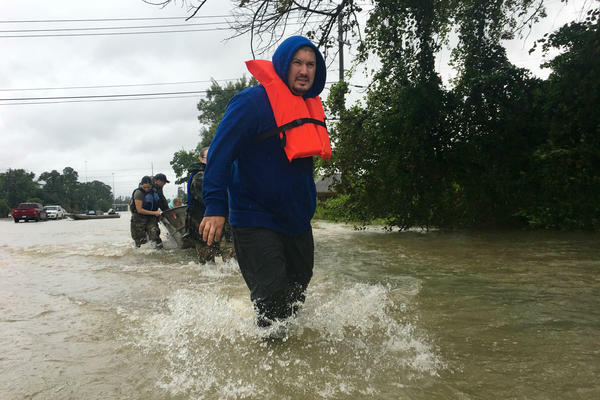 Six days after Hurricane Harvey first crossed the Texas coast, Houston is still in rescue mode with people stranded in houses and apartments. NPR's John Burnett rode along on a citizen-led rescue and sent us this story. JOHN BURNETT, BYLINE: Rene Galvan is worried. In a soaked blue hoodie, he sits anxiously in the bow of an aluminum boat, wondering how they're going to get to 14 members of his extended family who've been stranded by rising water. RENE GALVAN: Oh, I'm trying to get my family out here, save them. They could help me bring my family back home. BURNETT: OK, where's your family? R. GALVAN: About five minutes away from here. BURNETT: That's five minutes away by car. It will take considerably longer to reach the Galvan family in this boat and another one. They have to make their way through an obstacle course of underwater trees and concrete barriers, treacherous currents and submerged tractor trailers. After 2 to 3 feet of rain over five days, Greens Bayou has swollen into a lake that covers a large section of northeast Houston. TED MIDDLETON: Had some free time, so - had a boat in the garage - seemed like a good match, you know? Come out, and try and extract some people. BURNETT: Ted Middleton drove over from San Antonio, towing his V-hull 40-horsepower bay boat. MIDDLETON: We got in late last night, and they suspended operations after dark. So we waited till daylight. We've just been riding around, trying to find an extraction. Finally this one came along. BURNETT: He's joined by two soldiers in soaked uniforms who asked for a leave from their unit at Fort Hood to come down to Houston. They are Specialist Andrea Viela and Specialist Katie Cash, who speaks here. KATIE CASH: She has family down here. So we came out initially to try to get them out. But then we met Ted, and we've been trying to save as many people as we can now. BURNETT: The two skiffs motor through a dream sequence of surreal sights in this watery landscape. A big, black horse wanders along the shoulder of a highway bridge, confused and wet. UNIDENTIFIED WOMAN #1: Oh, look at the horsey. BURNETT: A fleshy man with a tattooed torso stands impassively in water up to his chest as though this is all normal and politely waves off an offer to climb in the boat. A short distance away, a couple hip-deep in water is towing an air mattress carrying two shivering Chihuahua dogs. Meanwhile, Rene Galvan has reached one of his brothers on his cellphone. R. GALVAN: No, stay right there. We're going - we're trying to see if we could drive the boat over there. BURNETT: We're cruising alongside a road whose name is - and I'm not making this up - Lake Houston Parkway. But the pavement is getting so close we can see yellow lane markers. Our captain is concerned. MIDDLETON: We're running out of water here. BURNETT: Both volunteers tie off their vessels. Rene Galvan hops out and sloshes toward a dry street intersection a couple hundred yards away. About 20 minutes later, a white expedition drives down the center of Lake Houston Parkway towards us, creating a wake in 2 feet of water. It's the Galvan clan. They're packed into the vehicle, six adults and eight kids all grinning ear to ear. This is brother Jaime Galvan. JAIME GALVAN: We were at the apartment. I mean it wasn't flooded. The lights went out, so we were - I mean we had to move. BURNETT: The family saw the water was not going down. The power was not coming back on, and they were about to run out of food. So they called Rene and asked him to find a way to get them. UNIDENTIFIED PERSON: Dad, you ready? BURNETT: The boatmen decide they'll have to make two trips for all the Galvans, the rescuers and two journalists. Only 1 of the 2 soldiers will ride in the first boat shuttle. How do Katie and Andrea decide who gets to go and who gets to stay? UNIDENTIFIED WOMAN #2: Rock, paper, scissors, shoot. BURNETT: Rock, paper, scissors, of course. UNIDENTIFIED WOMAN #3: Two out of three. BURNETT: On the way back to the highway ramp, I ride in the second boat. It's piloted by Troy King from the East Texas town of Carthage. He works at a lumber factory making plywood, and he fishes for crappie in this flat-bottom boat. He says he saw the Houston floods on the news, and it moved him. TROY KING: I'll tell you something that I read in the Bible. There's a passage in first John. It says - I'm going to paraphrase - if a man has the resources to take care of people and to help people when they're in need and he doesn't do it, then it's - is wrong. And that's something that's just been on my heart when I read that. I knew I had the ability to do it. And I came down here. BURNETT: You cannot overstate the danger of this epic flood. Earlier Wednesday, a sheriff's spokesman reported that divers have recovered a family of six, including four children, who drowned in a van that tried to drive through this same body of water, Greens Bayou. Troy King, dressed in camouflage hip waders, squints at a section of churning floodwaters flowing through a tangle of trees off to our left. KING: You don't realize how close to death you are right there. BURNETT: The Galvan children, some as young as 8, are shivering in their life preservers. But they're clearly having the adventure of their lives. They hold hands and high-step in shallow water on a freeway bridge. BURNETT: And then nearly three hours after we started, it's over. The boats nose up to the concrete ramp. UNIDENTIFIED WOMAN #5: Thank you. UNIDENTIFIED WOMAN #4: Thanks so much. BURNETT: You're welcome. You're welcome. UNIDENTIFIED WOMAN #4: We really appreciate it. Thank you, guys. BURNETT: The Galvans pile into two waiting pickup trucks with the kids sitting in back in the drizzling rain and drive to their grandmother's house. There they have hot showers. Eat some tomato soup. And all take naps. John Burnett, NPR News, Houston. Transcript provided by NPR, Copyright NPR.